Below is a select collection of resources available through Gumdrop. The complete collection can be added as a folder to your Google Drive by clicking ﻿here﻿. PhET and BrainPOP are among the most widely used online resources of science educators. With the Google Apps for Education teacher in mind, Cinimon seeks to provide additional extensions for these great resources! Links below are samples of Gumdrop documents designed specifically for use in conjunction with PhET and BrainPOP. They have been linked to corresponding Next Generation Science Standards (NGSS). Additional documents can be found in Gumdrop. 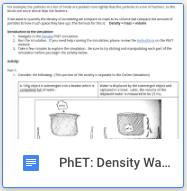 PhET: Density Water Tank: The PhET: Density Water Tank activity allows students to work with a virtual displacement tank to learn about density. The worksheet takes students through a series of activities which build their skills in measurement, use of the metric system, and develop their understanding of density.